First a slight note of caution: Expect initial mayhem! If you are planning to take the trans-Manchurian railway from Beijing to Moscow in the middle summer, be prepared to break a sweat, in fact you may have to endure a torrent of it. This is not only because Beijing is baking hot in July and you probably have been trudging through parks and temples all day while lining your back with glistening reams of sweat under a stuffy overcast sky, lovely though those parks may have been. It is also because you will first have to navigate through a Chinese central train station. This is not the new sleek southern train station, designed to look like an airport, currently floating on top of a quiet southern Beijing suburb. This is the old central train station of Beijing, a structure of the old communist school albeit, of course, with Chinese characteristics. 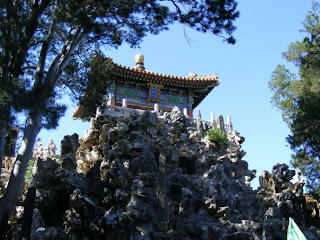 It is conveniently located in the centre of town but at the same time bursting at the seams with travelling Chinese. As anyone who has witnessed a traditional Chinese train station can testify, navigating through will invariably entail a certain measure of shoving, pushing and intermittent rushing. At least you can be thankful that you already have your ticket in hand and will not have to face the anarchic conditions of the ticket queue. As with all train stations, you emit a sigh of relief as you confirm finally that you are in the right waiting hall and that your destination, Moscow, is clearly marked above a clearly defined gate. You may even be able to sit down at this point or nip off to a shop and buy a bottle of water. Once the wait is over, however, the mad dash continues as you struggle along a current of Chinese travellers, deadly intent on getting on a train as fast as humanely possible. The frenzy of it all may seem mystifyingly pointless to an outsider clutching his reserved ticket. However, as rural China has shown me quite vividly on several occasions, an unwillingness to break a few arms and legs can indeed cost you a ride on an overcrowded bus. The principle is pretty much the same in Beijing; the transport services have improved massively over such a short span of time that the collective instinct for survival hasn’t quite caught up yet. A little bit more breathing space opens up as you hit the platform where you are greeted gruffly by the envoys of Mother Russia, in perms and moustaches. I don’t know whether the selection process for provodniks and provodnitsas, Russian train stewards, is specifically designed to produce a team that oozes a nostalgic whiff of Soviet Russia, but if it is they are certainly succeeding. Scowling looks is the most you will get out of them at this point. On entering the train, on the other hand, now, this is where the real sweat breaks: The train has no air condition as long as it is not in motion. All the bags can and eventually will be crammed in under bunks once an economical system for doing so has been worked out between complete strangers, with plenty of language barriers to work out between them. However, the task is near impossible as long as all four passengers are inside the compartment simultaneously; the provodniks will mercilessly hound anyone caught blocking the aisles. Even more extensive re-organization can unexpectedly occur. In our own experience, at the point were we had finally established workable communication, our Chinese co-passengers were all of a sudden removed, and two white faces emerge in their stead. I guess the provodniks got impatient. Once the train starts moving and the air condition kicks in, you will be able to breathe again, but at that point you will also be able to wring your shirt into a pool of sweat. Now, I wouldn’t say begging the hostel to be able to nip back in long after check-out for a quick shower before heading off was a complete waste of time. Personally, I will just say this: relief was all too much of a fleeting experience. However, that is forgotten as the evening draws to a close and our breathing gradually recedes from frantic levels to calm and eventual sleep. As the new day emerges, we have already crossed the symbolic frontier of the great wall and are already well on our way into the nomadic heartland of Manchuria. Now, I wouldn’t want to incur the wrath of the Chinese by suggesting that these northern lands are any less China than south of the wall. However, it remains inescapable that these endless plains was once beyond the confines of the Middle Kingdom and on it roamed for centuries the Jurchen and other such tribes. The northeast is most importantly the home of the Manchus, whose ancient capital Shenyang we pass on our northward journey, and whose leaders contributed decisively in enlarging China to its present size through the conquest of the lands of Mongolians, the Han, the Tibetans the Uygurs in the seventeenth and eighteenth centuries. The northeast is also the Chinese name of choice for the region, largely because the Japanese used the idea of a separate non-Chinese Manchu identity to establish the puppet state of Manchkuo. The Japanese presence also contributed to the northeast becoming China’s oldest industrial area, which today has left it with the rather dubious title of rust belt of China. The glimpses caught from our train leave memories of a very green and flat landscape, but also, as the epithet would imply, rust and decay and seemingly abandoned factories and rather sorry excuses for housing blocks strewn across the plains. On the way, we also skirt by the provincial capital of Haerbin whose onion domed cathedral reminds us that the claws of Russia once stretched slightly further than they do currently. The name Manchuria, however, has curiously stuck in one border town, which was to be our last snapshot of China before entering Russia. In Chinese, it is simply named Manzhouli or as we would translate it in English and the provodniks in Russian: Manchuria. Despite the seeming stagnation of the areas we passed on our way up, Manzhouli shows visible signs of a breakneck construction on a scale comparable to its small size but still vaguely reminiscent of coastal China. Choice of colour suggests the intended use of these buildings as either a casino or a brothel, but the impression is still favourable compared with the backwater encountered on the other side of the border. Border control also offer a fascinating contrast between the two countries: The Chinese is a sloppy 18 year old primarily interested in a commenting the merits of the various pirated DVDs he comes across in our luggage and chatting about our favourite destinations in his beloved China. The Russian, on the other hand, is clinically armed with a surgery mask and gloves and will shriek Narcomanie (i.e. drugs) and threaten confiscation as soon as she sets eyes on a few cough drops. The whole routine takes several hours on one side and half a day on the other, leaving plenty of time to explore the non-paved empty roads of Zabaykalsk. The town features a kiosk and, perhaps most strikingly, buildings that seem to have been abandoned half way into construction, by the looks of them, some time in the sixties. 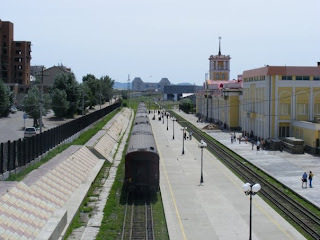 We spend the rest of the time in the waiting hall at the train station, munching on Russian cheese and sausage and watching Russian day-time television. But that’s Russia and a whole other story, coming up next.